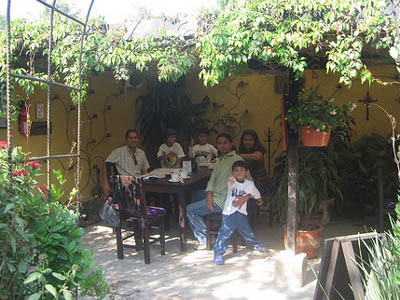 This is part of a small chain of restaurants in Guatemala perfect for their fondue. The one in Antigua has a great terrace where my son was able to run and play while we waited for our food. My son and I loved the sausage meal. Even the pickiest eater would love it. You can find this restaurant right next to Hotel Santo Domingo. 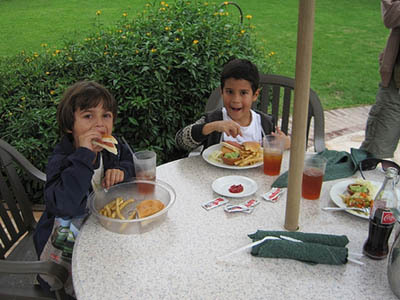 This hotel is just a 3 block walk away from the park and I consider it is one of my favorite kid friendly restaurants because they have a big open area and a great play ground. On Sundays there is even a kid’s club filled with toys and fun things that my son and his little partner loved. 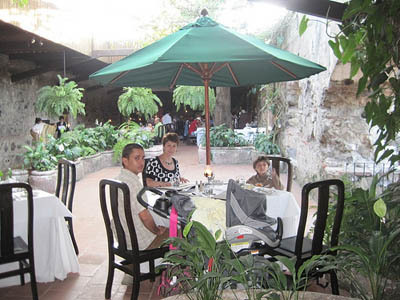 The restaurant is pretty formal and is in the middle of the ruins of what used to be a convent in the colonial days of the city. However there is an outdoor area with an open space for kids to have some fun. And because it is in the middle of ruins in my son’s words “I felt like an explorer.” Plus the food is delicious. What more could a parent want? This is yet another place where kids can run around in a safety environment. I don´t know about your kids but my son loves to run, explore and climb everything he sees so this kind of restaurants are perfect for me. The tables are in the middle of a garden but separated enough to give you some privacy. This is a bar at night but during the day it is a great place to take your children to. Their logo is a very funny monkey that my son loves. So you can imagine what happens when we walk across their gift shop (where the monkey is in everything). This place is also known for having great food but the kid’s choice is the nachos. They serve a big plate filled with nachos. The second best thing of this place according to my son is the pizza. Marina K. Villatoro has been living in Central America (Costa Rica and Guatemala) for over 9 years and her site Travel Experta and Expert Travel for Costa Rica is all about traveling in Central America. Marina loves to help people plan the perfect vacation to this amazing part of the world! Contact me for advice and planning your perfect trip! You can sign up for her RSS feed and join the fun on her facebook fan page and follow her on Twitter at @MarinaVillatoro.